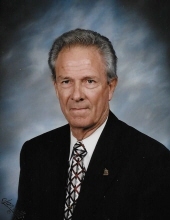 Jessie V. “J.V.” Hart, 86, of Hurley, MS, went to his heavenly home on Saturday, February 9, 2019 in Lucedale, MS. J.V. was born on November 1, 1932 in Lowery, AL to the late Robert W. and Fannie Lou Hart. J.V. was an avid hunter and fisherman and enjoyed the outdoors, especially landscaping. He took pride in keeping his yard well-manicured. He was a veteran of the United States Army and was stationed in Germany for two years. After his tenure in the service, J.V. returned to Ingalls Shipbuilding, where he worked for over 43 years until his retirement. He, along with his wife Dolores, was a member of Full Life Assembly of God Church in Hurley. In addition to his parents, J.V. was preceded in death by his brothers, Lucine Hart, Robert Austin Hart, and Ted Hart; sisters, Darnell Hart, Letha Mae Helms, and Bobbie Lee Odom; and best friend and nephew, Billy A. Hart. He leaves to cherish his memories his devoted and loving wife of 66 years, Dolores Hart; children, Rhonda (Joel) Watford, Karen Mitchell, and Steven R. (Elizabeth) Hart; grandchildren, Kelli (Dennis) Tufnell, John Austin (Cami) Mitchell, Derek (Rachel) Mitchell, and Mandy (Jeff) Roberts; great-grandchildren, Gage Tufnell, Kambrie Tufnell, Ryker Tufnell, Elizabeth (Andrew) Johnson, Selah Grace Mitchell, Judah Mitchell, Isabel Mitchell, Julia Mitchell, and Taylor Roberts; one great-great-grandchild, Abner Johnson; one brother, William Orell (Allie) Hart; along with numerous nieces, nephews, other family members, and friends. The funeral service for J.V. will be held on Tuesday, February 12, 2019 beginning at 1:00 p.m. at Heritage Funeral Home in Escatawpa, MS with Bro. Jimbo Reed and Bro. Rodney Coleman officiating. There will be no visitation prior to the service. Entombment will follow in the mausoleum at Jackson County Memorial Park in Pascagoula. In lieu of flowers the family has requested donations be sent to the Alzheimers Association at www.alz.org in memory of J.V. To send flowers or a remembrance gift to the family of Jessie V. "J.V." Hart, please visit our Tribute Store. "Email Address" would like to share the life celebration of Jessie V. "J.V." Hart. Click on the "link" to go to share a favorite memory or leave a condolence message for the family.